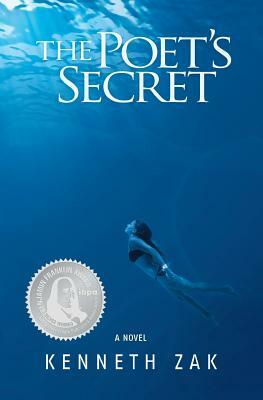 BEST FIRST BOOK SILVER MEDAL (FICTION) 2016 IBPA BENJAMIN FRANKLIN AWARDS / BOOK OF THE YEAR FINALIST (ROMANCE) 2015 FOREWORD REVIEWS INDIEFAB AWARDS - The Poet's Secret is an upmarket romantic suspense adventure novel powered by two remarkable yet fractured characters: Elia Aloundra, a young lit student, and Cameron Beck, the reclusive, suicidal poet she is on a quest to find. Decades earlier, Beck penned his acclaimed masterwork inspired by an anonymous muse, only to thereafter disappear. Elia always found sanctuary within the works of the literary greats and considered Beck worthy of that pantheon. Hoping that the poet will unveil the secret to eternal love, Elia faces off with Beck's protective circle on an exotic island hideaway, the same island where decades earlier a Spanish shipwreck entombing mystical Aztec relics was found. What Elia cannot fathom is that Beck's secret will change both of their lives forever. "A lyrical tour de force" - Foreword Reviews; "Golden Heart Finalist" - Romance Writers of America (romantic suspense); "A Beautifully Crafted Gem" - Dirk Cussler, Best Selling co-author of Dirk Pitt adventure novels, with Clive Cussler; "Exotic Mystery and Romance" - Judy Reeves, author of Wild Women, Wild Voices; "More than just a good read, this is a book to savor." - Kim Fay, Edgar Award Finalist author of The Map of Lost Memories. The author wrote the novel while on a three-year pilgrimage traveling abroad, writing, reading, surfing and slowing down his existence. Each chapter begins with brief excerpts of poetry from the reclusive poet before moving into the narrative prose. The author's influences include Pablo Neruda, Rumi, Wallace Stevens, Paulo Coelho, Gabriel Garcia Marquez, Haruki Murakami and others. Proceeds from The Poet's Secret proudly support Surfrider Foundation and 1% For the Planet, two conservation groups. The poem "Two Bits" from The Poet's Secret previously appeared in Kelp Magazine. Zak's short fiction "A Promise" appeared in A Year in Ink, San Diego Writers, Ink Anthology, Volume 4 and his short fiction "Thea" appeared in A Year in Ink, San Diego Writers, Ink Anthology, Volume 8. The Poet's Secret is his debut novel. For more information, please visit www.kennethzak.com and Kenneth Zak Author on Facebook.